According to a report in the Annals of Internal Medicine, the average person sits for more than half the day. We spend long hours sitting at our desks in front of the computer, in the car getting to and from work, and on the couch in front of the television. Those hours of sitting can have serious consequences, including disease, aches and pain. Scientists who study the impact of sitting are warning us that we should be concerned about how much time we’re spending in our seats. Some of the health conditions linked with sitting too much are heart disease, intestinal disorders, varicose veins, weak bones, muscle degeneration, brain damage, and increased risk of colon, breast, endometrial and lung cancer. Sitting for long periods of time also has a remarkable impact on your posture. When you sit and stare at a computer screen for hours, your head tends to move forward out of its neutral position. This puts excessive strain on the cervical vertebrae and can lead to neck, shoulder and back pain. When you sit in a hunched or rounded position, the discs of the spine become compressed. Over time, they will lose their ability to expand and contract with movement, increasing the risk of disc herniation. The good news? Even if your job or lifestyle requires you to sit for long periods at a time, you can counteract the negative impact of too much sitting with simple yoga asanas. By bringing movement back to the spine, the following poses lubricate the vertebral disks, open stiff and sore muscles, and strengthen muscles that are weakened by long sitting sessions. They provide both immediate relief and, over time, will gradually unravel the longer-term effects of sitting too much. Begin on hands and knees in a downward-facing tabletop position, with wrists under shoulders and knees under hips. As you exhale, tuck your pelvis, draw your navel towards your spine and round your back. The neck muscles will release as you lower your head to look towards your navel. As you inhale, tip your pelvis, move your belly downward, lift your chest and move your gaze forward. Flow back and forth between these two shapes several times, connecting your movement with your breath. Lie on your back, with knees bent and feet on the floor. Pressing down into your feet, lift your hips, shift them slightly to the right and place them back down. Draw your knees towards your chest and lower them to the left. Spread your arms into a T-shape on the floor. If possible, turn your head to look past the right fingers. If that strains the neck, keep your neck relaxed and look up towards the sky. Take several breaths here before returning knees and hips to center. Repeat the twist to the other side. 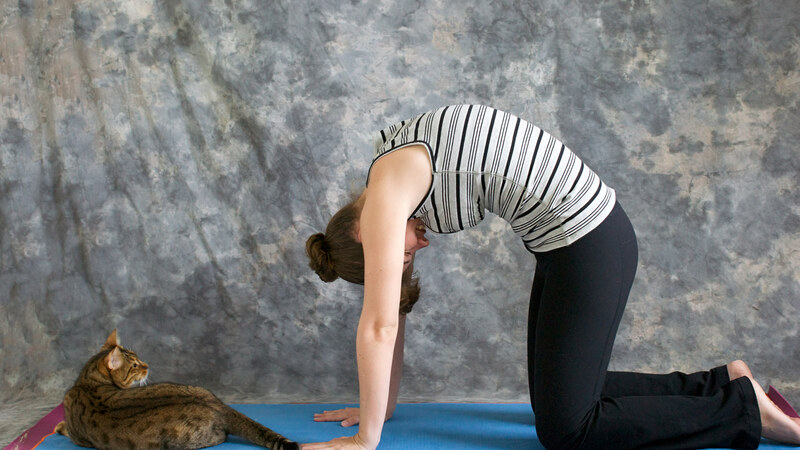 Begin in a downward-facing tabletop position, as you did for Cat-Cow Pose. With index fingers parallel, step your hands forward slightly, spread your palms and tuck your toes under. Slowly straighten your legs, at the same time reaching your hips up to the sky, pushing the tops of your thighs back and pressing your heels towards the floor. If the spine moves out of its neutral position and rounds, bend your knees enough to maintain length in your spine. Press your chest towards your thighs while extending through your arms. After several breaths, return the knees to the floor. Stand on your shins. If your knees are sensitive, place a blanket underneath them. Stretch your right leg out to the right, while keeping the left knee directly under the left hip. Externally rotate the right thighbone so the right kneecap faces towards the sky. Press the right toes towards the floor. Extend your arms out side to side. Bend to the right, bringing your right hand to your right leg and sweeping your left arm up and over your head. While pausing in the side bend, rotate the upper torso towards the sky. After several breaths, return to center and repeat to the left. Lie on your back with knees bent and feet on the floor. Place your feet parallel and about hip width apart, with your ankles directly beneath your knees. Extend your arms along your sides. Spread your feet and root evenly into them, at the same time pressing your arms and palms down. Lift your hips away from the floor and roll up through the spine. When you’ve lifted your hips as high as possible, either continue pressing your arms into the floor by your sides or interlace your fingers underneath your pelvis and press the outer edges of your arms into the floor. While pausing here, keep your feet and thighs parallel and lift your pubic bone towards your navel. After several breaths, unlace your fingers and roll down through the spine until your hips return to the floor. Lie on your belly with your forehead on the floor, arms by your sides and legs about hip width behind you. Untuck your toes so the tops of your feet are on the floor. Lengthen your tailbone towards your heels and press the pubic bone into the floor to bring the pelvis to a neutral position. Slightly internally rotate your thighs and extend your legs behind you as you press the tops of your feet into the floor. Lift the head, upper torso and arms, turning your palms to face your body and firming your shoulder blades against your back. Keep reaching your legs towards the wall behind you as you float your feet and legs away from the floor. Create even sensation along the backs of your legs and through the lower, middle, and upper back. After several breaths, slowly return to the floor. Read more from YogaUOnline on why you should be standing - rather than sitting - when you read this article! More YogaUOnline helpful information to curb your sitting hours. Christine Malossi, RYT is based in New York City, where she offers a mindful, alignment-focused Vinyasa practice that cultivates balance, awareness and equanimity. In addition to teaching private clients and group classes at studios throughout Manhattan, she also teaches at the Spencer Cox Center for Health at Mount Sinai Hospital’s Institute for Advanced Medicine whereshe designs a practice specifically tailored to patients diagnosed with HIV and other chronic illnesses. Christine is honored to be teaching yoga and to have the opportunity to pass on to others the joy and freedom that she has found in her own practice. Find her at www.christinemalossi.com.